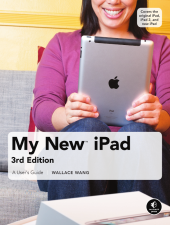 “My New iPad,” by Wallace Wang, is the third edition of a popular user guide on how to do just about anything and everything on the iPad. It’s $25 from nostarch.com. We’ve talked to several iPad owners who didn’t know about “FaceTime.” This book is for them. Apple’s “FaceTime” is an app for video chatting, just like Skype. Mac users can also use Facetime if they get the new $20 Mountain Lion operating system. “My New iPad” covers just about everything in a friendly easy-to-follow style, starting with how to turn it on and off and how to make the battery last longer. It also teaches you how to use the Maps app and iPad’s compass. Discover how to use the reminders and calendar apps, dictate notes, listen to music, and read ebooks and magazines. Here’s an extra tip we didn’t see in the book: How to cancel a subscription with your iPad. Joy signed up for a trial subscription to the New York Times. If she did nothing further after the free trial, she would be dinged $20 a month till the sun burns out. So she launched iTunes on her desktop and clicked “Account.” Then scrolled down to “Settings” and clicked “Manage subscriptions,” and easily turned off the Times’ automatic renewal feature.